One of last year’s leading scorers Connor Boehm ’16 also chipped in 13 points in just 16 minutes. Miles Wright ’18 and Evan Boudreaux ’19 rounded out the scoring, each adding 11 points. The team’s win was keyed in by a particularly strong first half, in which the team outscored Keiser 43 to 15. Dartmouth also dominated in several key categories outside of total points, including rebounds and assists. The team limited its own personal fouls to a mere 10 total while taking advantage of Keiser’s 20 personal fouls by scoring 17 points off of 20 free throw opportunities. Although the win did not officially count toward its record, the team enjoyed its first real game experience of the season. “It got our freshmen acclimated with the way we play and the speed of the game. It was good for all of us to be out there in a real game setting,” Wright said. “Even if you go through preseason, 20 practices and have a lot of experience, there’s no practice that’s similar to a real game as a real game.”. Wright said he thought the team played well, particularly with how well the team shared the ball and defended against Keiser. With the exhibition game behind them and the regular season beginning soon, he said he hoped the team would be able to translate the same strong play into the rest of the season. Although it did not necessarily contribute to the team’s overall record, Taylor Johnson ’18 also noted that the team can learn from the exhibition game. The team, he said, is looking forward to the challenge that will come with more games. With the rest of the season will also come time for new players to acclimate themselves to playing and the team as a whole coming to fill the positions of graduated players. Overall, Wright said, this year the team prides itself on its depth. One reason for the great depth of this year’s team is the addition of three highly-touted freshmen, particularly after Thursday’s game saw two first-year players posting some of the highest point totals on the team. Johnson pointed out the amount of time that both Smith and Boudreaux spent playing in the game against Keiser and the contributions they made to the team’s victory. He also highlighted Michael Stones ’19 as someone he sees proving to be a great player throughout the season. Overall, he said that all three have been working hard and developing well. The budding team chemistry has also led to a team-first mentality. Wright, the reigning Ivy League Rookie of the Year, looks to continue improving both individually and as a team player. On Nov. 13, the men’s basketball team will formally kick off its 2015-16 season with an away game against Seton Hall University in Newark, New Jersey. Last season, Dartmouth finished on a five-game win streak, including a victory over first-place Yale University, to end the regular season with a respectable 7-7 conference record. It marked the team’s first non-losing regular season since the 2008-09 season, when it also finished 7-7 in the Ivy League. 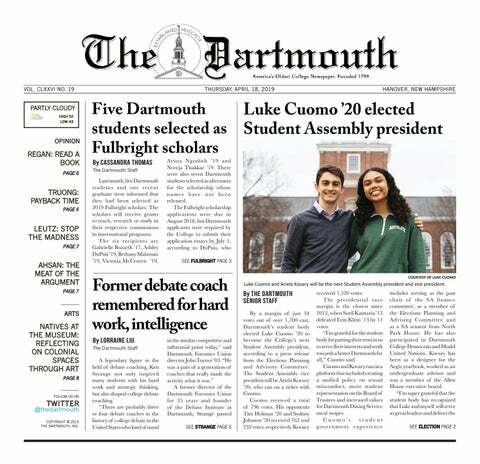 Dartmouth placed fourth in the Ivy League last season, and this time that resume was enough to propel the team into the postseason for the first time in 56 years. But the Big Green’s impressive regular season run was abruptly ended in the first round by the Canisius College Golden Griffins by a final score of 87-72. Led by head coach Paul Cormier, the team looks to build off last year’s strong season.